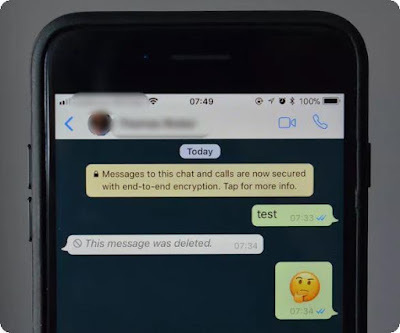 WhatsApp is adding the ability to delete and revoke messages after you’ve sent them, following a test of the feature for most of 2017. You’ll be able to delete messages up to 7 minutes after you sent them, and they’ll disappear from conversations or group chats. A new WhatsApp support article, reveals that both sender and receiver will need the latest WhatsApp for this feature to work. The feature is rolling out gradually to WhatsApp users this week. This feature was already enjoyed by GBWhatsApp users in the GBWA v5.9 September Update. To delete messages you’ll get a new option after you select delete, allowing you to “delete for everyone” instead of just from your own device. However, after 7 minutes, you can no longer "delete for everyone". While the feature appears to be rolling out, it’s not fully live just yet. WhatsApp does warn that “recipients may see your message before it's deleted or if deletion was not successful,” so it’s not a guarantee. It’s also possible that WhatsApp users will still see messages in notifications before they’re deleted. Either way, this is a good addition for those mistaken messages or alcohol-induced ones. Just remember it might not always work, and WhatsApp won’t notify you if it does fail.